Elevated Garden Bed- Truly UNlimiting! Spring is almost here! With only one more winter event forecast for the end of the weekend, I’m optimistic that the warmer temperatures will stop flirting and will finally stay in place. This winter has been nothing short of brutal, and I can’t wait to stop hibernating under my electric throws and again seek warmth from the sun. With my thoughts focusing on warmer weather, I have begun one of my favorite Springtime endeavors- planning my garden. I am, by no means, an expert gardener. However, I do enjoy tinkering in the soil and watching my efforts grow into a variety of delicious vegetables. As an unanticipated bonus, I discovered that my son is far more willing to try new vegetables if he has had a hand in the growing process. For our family, gardening has allowed us to spend some quality time outdoors while expanding our palettes. Because I have a little boy who is eager to help, I don’t have to deal with the discomfort of stooping and bending while tending the garden. He is at an age where he is happy to assume this responsibility! Unfortunately my Mom is not lucky enough to have eager young hands to help her, and after her knee replacements she almost abandoned her favorite Spring/Summer hobby altogether. Kneeling and squatting with knee replacements is both painful and difficult. Her back is not nearly as spry as it was in her youth, so bending at her waist to tend a traditional garden was not an option. Unwilling to allow her to give up, I searched for an alternative to the traditional raised garden. I purchased this elevated garden bed for Mother’s Day a few years ago, and it has been a game changer. Because the garden is on legs, she can plant, tend and harvest her produce without bending, kneeling or stooping. She could even tend the garden from the comfort of her wheelchair! The large bed offers the depth she needs to grow all the vegetables she desires. She was even able to grow a small patch of carrots! Because the entire garden is on a tall platform, weeds are virtually non-existent and her dogs don’t dig up her harvest prematurely. 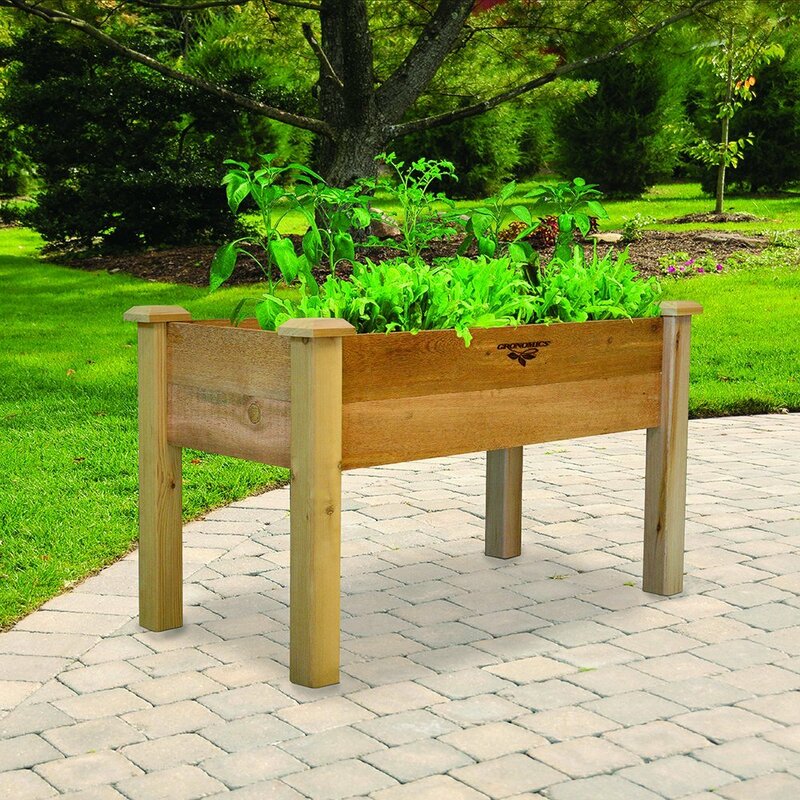 The elevated garden box is easy to assemble, and required no tools. Although neither of us are mechanically inclined, my husband and I had it assembled in less than an hour. We filled it with potting soil (which in truth was probably the most difficult task) and she was ready to start planting. Set-up could not have been easier, and the end result was surprisingly sturdy and durable. My Mom accepted that she had to give up a beloved activity because of mobility issues. This elevated garden is more proof that anything can be accomplished with a combination of desire and adaptations. It turns out that it is possible to enjoy the benefits of tending a garden without bending, and without pain. For my Mom, the elevated garden bed has been UNlimiting! Before I was a busy, working Mom, I used to love cooking. Time in the kitchen became my creative outlet. I prided myself on preparing delicious and nutritious meals with little regard to the amount of time required. Now the stress of having to cook every single day has worn on my creativity and passion. Lately, it feels more like a chore. Every once in awhile I find something that reignites my passion in the kitchen, but for the most part it has been relegated to something that is looming everyday on my “to do” list. In addition to the stress of having to come up with a menu every single day, spending time on my feet has become increasingly difficult. I’m now in my 7th month of pregnancy, and I’m tired! My prostheses fits, a fact for which I am grateful, but my gait has been compromised because of my growing baby bump. Walking, standing and moving in general are all becoming more fatigue inducing. At the end of the day, all I want to do is slip off my leg and relax on the couch. Instead, I find myself in the kitchen desperately trying to cook a quasi-nutritious meal in the least amount of time. 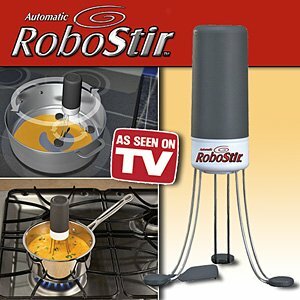 This past Christmas I received the Robo Stir from my Mom. At the time I thought that it was a clever contraption, but I never envisioned that it would become my go-to tool in the kitchen. After all, I’ve had little success with the “As Seen on TV” miracle products. I wasn’t expecting much, but shortly after the holidays I pulled the Robo Stir from its clam shell package and decided to give it a try. I have to admit that I was shocked not only by how well this little pot stirrer works, but by the amount of time it saves me on my feet. Right now, anything that keeps me off my feet and saves me energy is elevated to one of my favorite things! From stirring cheese and spaghetti sauces to basic gravy, this wonderful little device has been a godsend in my kitchen. After I make the sauce, I simply put the Robo Stir into the pot and press the button. The stirrer keeps everything moving, allowing it to cook evenly and without burning. And my favorite perk- I no longer have to stand at the stove. While everything is coming together I can sit down and relax. The Robo Stir has UNlimited me in the kitchen. I have been impressed with how consistently everything is stirred. As a bonus, I have yet to have anything burn while using it. Unfortunately, I can’t say the same when I’m stirring by hand. Perhaps surpassing the function, I love that I can sit down and relax while cooking dinner. I have such limited energy right now that anytime I can save myself standing it is worthwhile! Our house is an electronics lover’s paradise. A quick count reveals that we have four DVD players (including the one in the car), an Xbox and a Wii. While I have come to accept the cords and power strips, there is one aspect of living with all of these devices which has been driving me batty. Every DVD, and every single game, comes in a plastic case which I found impossible to conveniently and aesthetically store. My husband blames my desire to tidy-up on pregnancy nesting. I contend that I’m just tired of living in clutter. Either way, this past week I have been on an organizing mission, and those plastic DVD boxes was at the top of my list. Organizing the games and DVD’s on a bookcase did not work for our family. I discovered quickly that my husband and son would find the desired case, pull out the disk and put it in the appropriate player. When they were ready to switch games or videos, they would get another game without putting back the one which had been in use. A pile of silver disks quickly accumulated on the edge of the TV table while the plastic cases littered the couch and coffee table. Unfortunately, the cats find playing with the silver DVD disks amusing, perpetuating the clutter factor. 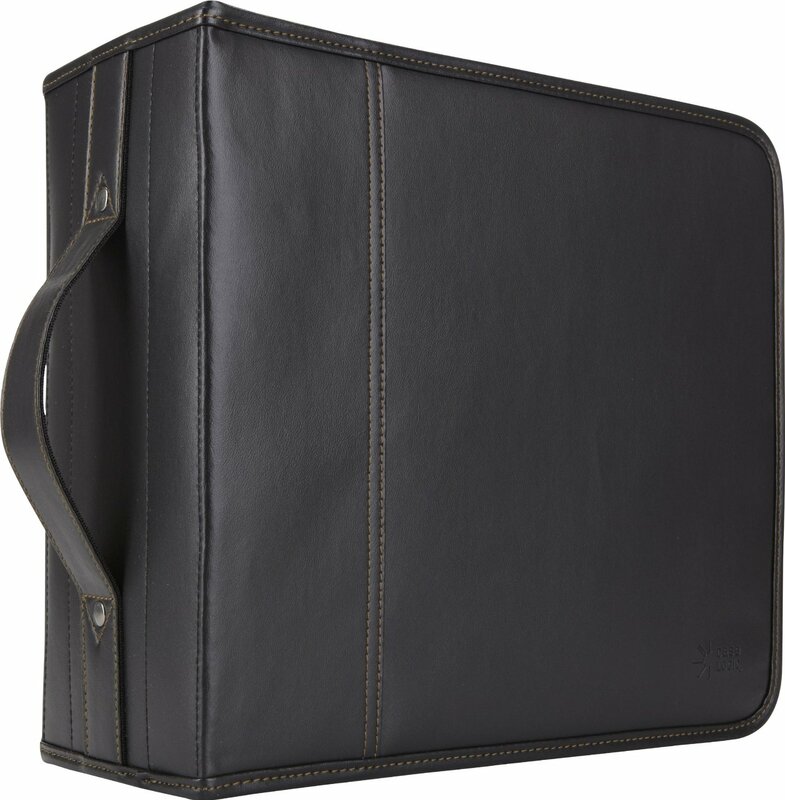 or bulky, this binder has the capacity to store 336 disks! While everybody was at school (my husband is a teacher), I gleefully liberated every video and game from it’s case. I tossed the empty containers in a large box (for storage in the garage) while I organized the DVD’s into the binder. In less than an hour I had liberated three shelves of DVD boxes and consolidated all of the games and DVD’s into one convenient location. Now instead of having piles of DVD’s and empty boxes strewn through the family room, everything is organized in a zippered binder. The previously overwhelming game and movie library is now stowed conveniently under the coffee table, allowing it to remain accessible for my gamers while still accommodating my emerging organizing compulsion. I wish I had thought of consolidating everything into a binder years ago! It is amazing how such a simple concept, such as consolidating everything into a binder, can solve a frustrating issue. I have always been a sucker for skin care. From ointments touting perfect skin to lotions which promise to miraculously erase the wrinkles of time, I have them all. Not surprisingly, most do not work and have taken up residence in my large “drawer of disappointment” under my vanity. My interest in skin care and make up wafts and wanes throughout the year but always crests in mid to late February. I suspect that the dreary cold weather, coupled with the post-holiday depression combine to make me feel inadequate and ugly. I’ve noticed that make-up advertisements and sales seem to inundate us this time of year, so I must not be the only woman with this seasonal reaction. Despite spending thousands of dollars over the years on hundreds of little tubes and bottles, I have finally settled on two products which I use on a consistent basis. In fact, this is the first year that I haven’t added a few little bottles to the “been there, tried that” abyss of failure. This year, instead of scouring the ads for the next best thing, I happily trudged along with my existing skin care routine. I don’t have the time to mess around with multiple products. I have no interest in investing 30 minutes in a skin care routine. I like to keep things simple, and with L’Oreal Youth Code Day Lotion, this is possible. I love the slight scent, which I find uplifting but not overpowering. The lotion goes on smoothly, and probably more importantly, it absorbs quickly. After a few days I noticed that my skin was smoother and had an even tone. Although I don’t know if it erased any of my emerging fine lines, I do know that I feel prettier and younger since using the product. After the day lotion is absorbed, I use the Youth Code BB Cream as my foundation. This tinted cream goes on quickly and is easy to apply. With this BB Cream, those pesky foundation lines are gone and my skin tone simply looks naturally flawless. The coverage stays put throughout the day, allowing me to avoid transferring my foundation on my shirt collar, napkins, my cell phone and any other item which touches my face throughout the day. I love my Youth Code Day Lotion and BB Cream, and I don’t see myself switching products anytime soon. These products suit my needs and my lifestyle. (My husband also appreciates the fact that I am not spending oodles of money searching for the next best thing!) The Youth Code products have Unlimited my skin care routine, allowing me to feel pretty with a minimal time investment. One of the most common questions I receive from new amputees, especially in the winter and cold months, involves footwear. Never being a shoe connoisseur myself, having to tackle footwear post-amputation quickly became an exercise in frustration. With my apologies to my fashionista friends, I admit to sticking with the same pair of shoes regardless of the rest of my outfit. I prefer to go for comfort and, with the exception of a social protocol, I would probably never change out of my sneakers. Of course, some situations require a change in footwear. With a massive snowfall and a little boy eager to go outside to play in the winter wonderland, I was confronted with one of those situations yesterday. While I technically only need to wear a boot on my biological foot, the difference in heel height makes trudging through the snow difficult. My lower back and hips thank me when I take the time to put the same shoe on both my prosthesis and my foot. Slipping a boot onto my prosthesis is not always an easy task. Because the ankle is fixed, guiding the foot shell into the bed of the ankle can be difficult. Thankfully I’ve learned a few tricks of the trade to donning boots onto my prosthesis. First of all, I always try to buy the boots ½ size larger than my needs. Because I know I will be in the snow, I anticipate wearing thick socks to make up the size difference on my biological foot. The extra room makes sliding the prosthesis into the boot a little easier. I don’t worry about wearing a sock on my prosthesis (after all my toes certainly are not going to become cold) so I have forged even more wiggle room to fit the boot. Perhaps my favorite tip, I have discovered that slipping a plastic bag over the entire foot shell helps to minimize friction, making donning the boot a breeze. Since I learned the plastic bag trick, I no longer dread putting on boots! If need be, I pull out my extra-long shoe horn to make the final push into the boot. While my foot never becomes cold in the snow, my residual limb can become downright icy. The compromised circulation, the result of the amputation, makes me more vulnerable to temperature extremes. On more than one occasion I have come inside after snow fun to discover my residual limb is purple from the cold. 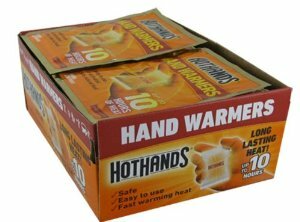 My second winter as an amputee I discovered the joys of air activated hand warmers. Typically sold in the check-out lines of the big box stores and sporting goods stores, I now buy them by the case online. Before sledding, snowball fights or fort building commences, I always activate and throw two hand warmers into the bottom of my socket. These little satchels help to keep my limb warm, regardless of the temperatures or the depth of the snow. With a little preparation and some of my “go-to” winter tips, I have become completely UNlimited in the snow. How do you deal with the winter weather? Next Friday is Valentine’s Day or, as my husband refers to it, the worst day of the year. While I tend to love all holidays, he leans towards the curmudgeon side. It isn’t that he lacks a sense of romance, but he does resent being told when he has to dote. Regardless of his feelings towards Valentine’s Day, I plan on celebrating all week. Thankfully my little boy has inherited my love of revelry and is fully on board with all things holiday related. I am sure that my son loves holidays because he knows that he will be showered with surprises and treats. Some say that I go overboard, but I know that I don’t spend a lot of money to make fun holiday memories and traditions. Instead, I rely upon a series of no or low cost surprises staggered throughout the week to make the holiday special. One of the best investments I made was in the Balloon Time Helium Tank. Balloons are expensive and not always easy to obtain and hide. This little tank makes it possible for me to blow up just a few balloons at my convenience. The look on my son’s face when he staggers out of his bedroom in the morning and discovers a few colorful balloons is priceless! He also loves shaped and themed breakfast treats. The Norpro Heart Shaped Pancake Mold is perfect for fashioning a festive and happy breakfast to start the week off right. I make enough to store in the fridge so that I don’t have to cook breakfast for the rest of the week. He’s happy because he is eating a special treat and I’m delighted with the minimal prep work. I don’t just spend the week pampering my son, I also treat myself a little better during holiday weeks. One of my favorite, and cheapest, luxuries involves painting my nails. Of course, painting the plastic nails on my prosthetic foot shell does involve some advance planning. I don’t have to use any specific nail polish, but I do need to rely upon an acetone based remover when I want to change colors. The non-acetone nail polish removers just smear the polish across the plastic foot shell. I guess in some situations the heavier chemicals are the best option! I love to take long baths, but I found that using oils or bubbles is not conducive with my residual limb. If my limb is coated in a thin sheath of oil, it slips right out of the liner. Trying to walk without a strong seal in the prosthetic is definitely not safe! Instead of oils and bubbles, I rely on bath salts. I found that the minerals make me feel relaxed and do not damage my skin. 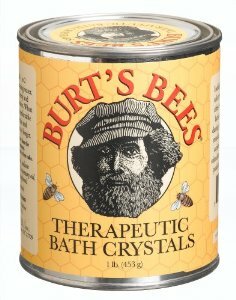 I’m not into heavy scents, so I prefer the Burt’s Bees Therapeutic Bath Salts. I am always a happier and more relaxed person after a long soaking bath. Of course, I won’t ignore pampering my husband next week. I know that he detests Valentine’s Day, but I won’t let that stop me from including him in our fun. 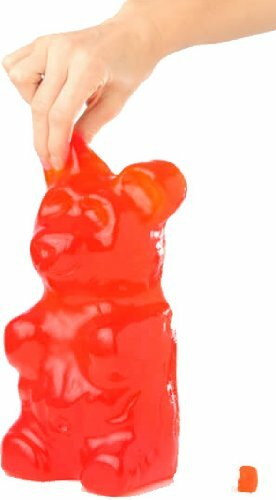 He loves gummy bears, so when I found this 5 pound version I knew I had to get it for him. Again, it doesn’t cost a lot of money but will certainly bring a smile to his face. However you celebrate, I hope that you have a wonderful Valentine’s Week! Rumor has it that a big football game is being played on Sunday. Admittedly, I am not a football fan but instead become the hostage companion of my sport fanatic husband during every big game/match/event. While I doubt I’ll ever relish watching the game, I have learned to embrace the festivities. For me, the Super Bowl is all about gluttony. In our house, no big game would be complete without chili, nachos and assorted snacks. For my husband and son, the food magically appears at the end of each quarter. So engrossed in the television, I am fairly confident that both fail to realize that I am the one in the kitchen prepping and cooking all afternoon. I have always loved to cook but it has become more difficult during the past few months. Between my prosthetic issues and my pregnancy, it is uncomfortable for me to stand for long periods of time. Thankfully I have cabinets full of appliances to help make the task both easy and fun. 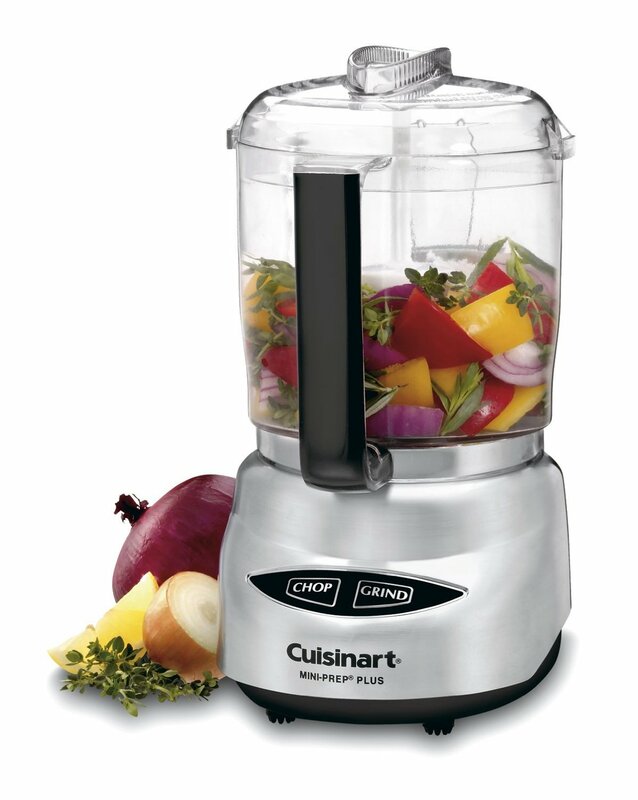 In order to minimize the prep time required for our football feast, I will be relying heavily upon one of my favorite appliances- the food processor. I have tried a few other mini choppers over the years and have always been dissatisfied. For a growing family, the 1 ½ cup choppers simply weren’t big enough. I found I was spending more time chopping and emptying small batches from the machine than I would have spent had I just pulled out the knives myself. Storing and pulling out the cumbersome and heavy 12 cup food processors became more trouble than what it was worth, especially when I was looking for quick prep work. I was more apt to let the food processor in the cabinet because the assembly and cleaning required was simply too time consuming. Thanks to my strong little chopper, I am saved both the time and the ensuing discomfort which comes from food preparation. I love to cook, but I also appreciate anything that simplifies my life! With the chopping simplified, I’ll be done in the kitchen and able to enjoy my favorite part of the Super Bowl- the halftime show. Generally speaking, I live a relatively UNlimited life. I suppose that living with my disability for more than a decade has allowed me ample time to adapt without much thought. Many of my accommodations for my limb loss occur so naturally that I must make a concerted effort to recognize the adaptations. Living a life with limb loss has become my norm. Although I’m comfortable with living as an amputee, I have come to recognize that I have made adjustments to just about every aspect of my life. From the obvious, such as installing permanent grab bars to my bathroom, to the discrete, I am constantly tweaking and searching for easier ways. Each change, in its own way, has helped to simplify my life. My family, especially my husband, consumes an obscene amount of soda. We used to have 2 liter bottles lined across the back of my kitchen counters, and mountains of cans stacked in the corner. Although I hated the aesthetic aspects that soda storage caused, I despised lugging everything from the car more! Carrying heavy and cumbersome objects is something that I will never ever fully embrace. I don’t feel safe when I can’t use the handrail when going up or down the stairs. Balancing heavy loads makes me feel precarious, especially when I can’t see my prosthesis to confirm proper step placement. Schlepping heavy boxes of soda cans, or bags overflowing with 2 liter bottles, was a chore which I avoided whenever possible. I’ve come to the conclusion that the Soda Stream must have been invented to make the lives easier of those with disabilities. Gone are the days of carrying heavy and awkward cans and bottles from the car to the kitchen. I no longer have 1/3 bottles of flat soda lined up on my countertop, and the soda can fort is gone from the corner of my dining room. I admit that I was skeptical of the Soda Stream the first dozen times I saw the store display. Would the soda taste good? Did the machine work as advertised? Was the convenience worth the initial investment? Would this machine actually end us saving us money? After finally breaking down and giving it a try, I have to say that the answer to all of these questions is a resounding yes! My husband and I have different tastes when it comes to soda, and we are now able to easily accommodate both of our preferences. Instead of pushing around the large bottles, we now have a variety of syrups which store discretely in our cabinet. At the push of a button we can make any soda desired and we don’t have to worry about the excess going flat. We only make what we can drink, assuring that we always have the proper carbonation. Although my husband loves the variety of flavors, I appreciate the fact that we no longer have to wrestle with moving heavy cans and bottles. This machine has completely eliminated a situation which used to render me uncomfortable and unsafe. In another small way, the Soda Stream has helped me to continue my UNlimiter status! I have always loved animals. Growing up we had both cats and dogs and, although I loved both, I have come to accept that I am more of a cat person. I have nothing against dogs, but I appreciate the self-reliance and simplicity of being a cat parent. Dogs, at least those that I have grown up with, tend to jump and knock me off balance. They grab dishrags, remote controls and cell phones and take of scurrying through the house, creating an ill-advised version of canine tag. Regardless of the weather or the state of my limb, a dog would have to be walked. For all of these reasons, I prefer feline companionship. Of course, these experiences are also an indication of our total inability to competently teach our canine companions. Cats, at least the two in our house, are low maintenance friends. They curl on my lap to get warm, play and entertain my little boy, and use a litter box independently. I appreciate all of those attributes. Both cats are full-fledged family members who know their roles and responsibilities. They don’t trip me up when I walk, catch a rogue mouse occasionally and accept doting and love. All things considered, being a cat in our household is a pretty good gig. The only part of cat ownership I don’t relish is the litter box. Of course, it certainly beats the alternative of pooper scooping outside in all weather. However, digging around in feline excrement is not my idea of entertainment. I’ve quickly discovered that a primary benefit of this pregnancy is the “no litter box” rule dictated by my OB/GYN. I have been coveting the Litter Maid automated cat box for years and was ecstatic when he came home with it one day. After filling it with litter and plugging it in, we anxiously waited for the cats to visit so that we could watch the machine in action. The prospect of not having to squat and precariously balance over a dirt filled, smelly and unhygienic box was almost too exciting to bear! I have to admit that I am surprised with how well this little machine works. In one movement it sweeps the dirty litter into a self-contained receptacle. The dirty litter container has a lid which helps to control odor and mess. Knowing that our house will again be wreaking with unsavory baby smells, any odor control barriers are greatly appreciated! Although I can’t change the dirty litter container when it becomes full, I have no doubt that the task will be both easy and quick. I am excited that I’ll no longer be squatting over the litter box, trying to balance while digging through a pan of cat excrement. The fact that I won’t have to be intimate with the cat box makes the prospect of my reassuming this responsibility acceptable. 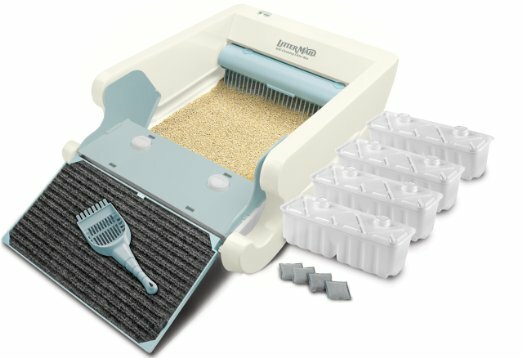 The Littermaid Automatic Litterbox is just another product which has helped me to become an UNlimiter! For weeks we have been inundated with commercials tempting us to eat the extra cookies, forgo the diet and indulge. It felt like it was almost scrooge-like to deny yourself. After all, it was the holidays! As soon as the countdown begins for the New Year, the messaging changes. Television commercials switch from “go ahead and eat the cookie” to “you’re fat because you ate too many cookies. You need a diet.” If we aren’t being told that we are fat, we are out-of-shape, disorganized or downright dirty. Watching television this time of years feels like an exercise in masochism. Personally, I prefer the pre-holiday commercials. At least when I turned off the television I was happily munching on a cookie instead of feeling like an overweight, out of shape, messy failure! Every year I have fallen into the New Year/New You marketing trap. This year is different. I am working too much, too busy with my family and I am pregnant. I don’t have time to beat myself up. This year, I have resolved to grant myself holistic acceptance. Maybe it is because I am turning 40 this year, but if I want to make a change in my life it will not be because celebrities on television tell me I’m overweight and need to buy their diet plans. Acceptance is turning into the greatest gift. Instead of starting the New Year feeling badly, I find myself feeling optimistic and happy. This doesn’t mean that I haven’t opened the door to improvement, but it does mean that I will make changes on my timeline, not based upon the changing of a calendar. Between managing my work, family and pregnancy, I am simply too overwhelmed to embark on any radical personal projects. With acceptance comes personal reflection. With my mind freed from self-punishing dialogs, I have rediscovered a sense of enthusiasm which has missing for some time. It is amazing the optimism that comes from switching the internal dialog from “you’re not good enough” to “what makes you happy.” Lately I have been so overwhelmed with ideas and dreams that I needed a place to write them all down. I suppose I could easily write my ideas into a Word document, but I spend so much of my professional life on the computer that I wanted something special. I have decided to go start an old-fashioned, pen and paper journal. I have discovered that there is something special about handwriting on paper. It takes more time, but it also allows me more of an opportunity to reflect and escape. In an effort to affirm that my thoughts, dreams and goals have value, I picked a journal which reflected my newly granted acceptance. Writing, just for myself, has helped to UNlimit my potential. Change is always difficult and is only successful when implemented on a personal timeline. Hanging a new a calendar, and being bombarded with negative messages is not the motivation most people need. This year, I encourage everybody to embrace acceptance instead of falling into the pattern of forced change. I truly believe that self-improvement will be a natural extension of acceptance, and that the changes will be lasting. For me, writing in a journal is my first step towards self-discovery. Ten years ago, when I began my new life as an amputee, I devised a lengthy list of things to avoid. Creating this list, although probably not the healthiest approach to rehabilitation, kept me occupied during the painful recovery. As the surgical and emotional pain waned and I mastered living life with a prosthesis, the majority of my self-imposed limitations were quickly eradicated. I learned that living an UNlimited life with a disability was possible. One of the self-imposed limitations involved ladders. The prospect of climbing a ladder, not my favorite task with two sound feet, became petrifying when I became an amputee. Climbing high, relying upon foot placement while lacking proprioception, made me feel vulnerable. I detest feeling vulnerable! Unfortunately, being a homeowner and a Mom was not conducive to a ban on heights. Light bulbs need to be changed, cabinet tops need to be dusted (granted not all that often) and toys need to be stowed out of reach. Perhaps more than feeling vulnerable, I despise feeling dependent. Having to wait for my husband to come home from work each time a simple height restricting chore needed to be done became frustrating. I knew that I had to figure out a way to complete these tasks unassisted, so one day I headed to our local home improvement store. Traditional ladders, with narrow or rounded rungs, were immediately eliminated due to my phobic safety concerns. I wanted something with wide steps, but I needed it to be lightweight and easy to handle. Minimal storage space was appreciated but was not a high priority. After looking through my options, I was delighted to find this Rubbermaid 3-Step folding step stool. The extra large steps eliminate the worry about the position of my prosthesis. The step stool is sturdy and is highly portable. I was delighted to discover that its compact storage size allows me to keep it between my refrigerator and the wall! This step-stool, although not nearly as high as a traditional ladder, allows me to safely and comfortably reach all light fixtures, cabinets and closet shelves. I love not having to ask for help to change a light bulb, and my husband appreciates having something removed from his honey-do list. This step stool is another tool which has helped me to become an UNlimiter! Perhaps my favorite part of working prosthetic conferences, with the exception of room service, is the ability to see all of the new prosthetic products available. I am constantly amazed at the rapid advances that are being made. While the focus is often on the computerized, sexier prosthetics, some of the most life enhancing products are often unsung and taken for granted. During my breaks I enjoy walking through the exhibition hall, talking with vendors and learning about new products. Okay, I also admit that I’m a sucker for samples and freebies. What can I say, conference swag makes me smile! I often come home from the conferences with an extra suitcase stuffed with samples, brochures and trinkets. Yesterday morning I was hurting. The skin on my limb was beginning to chafe, and a small blister on the side had still not healed. I reached for my go-to tub of Eucerin creme when I remembered that I had picked up a sample of a new product at a conference several months ago. In warmer weather I don’t encounter the chapping and chafing issues that often occur in the winter, so I have never had a chance to try the product. Touted as a solution to a chafing residual limb, I decided to put the claim to the test. As soon as the lotion was applied, I knew that it was special. It absorbed quickly, leaving my skin soft and smooth. Donning my liner was easy, and I didn’t feel the nagging skin tugging that I was experiencing when rolling on my liner. I stepped into my leg and took a few cautious steps. I never would have imagined that a simple lotion would have such a profound impact. My discomfort was completely gone! Needless to say, I was amazed. It turns out that my skin has been pulling against my liner. The constant tugging has been causing friction burns that resemble chapping. I assure you I am not a spokesperson for the company, but I couldn’t make this lotion discovery and not share my experience. After one day I am sold on this product, and I was delighted when I realized that it could be ordered directly by the consumer. (Anytime I don’t have to go through my doctor or prosthetist for a product I am a happy camper!) If you are having skin breakdown, or feel like you might be tugging within your liner, give Alps Prosthetic Skin Lotion a try. I was shocked that it yielded such profound results for me. Sometimes the simplest products can yield the most profound results!